PPS meets the growing information needs of scientists working in the areas of photochemistry and photobiology, and indeed, encourages a synergism between these two important research areas. This international journal is published monthly on behalf of the European Society for Photobiology (ESP), the European Photochemistry Association (EPA), the Asia and Oceania Society for Photobiology (AOSP) and the Korean Society of Photoscience (KSP), and is available in both print and electronic formats. PPS' 2013 impact factor is 2.344, according to the data released by ISI. Photobiological Sciences is covered by the Chemical Abstracts Service (CAS), Science Citation Index (SCI), Research Alert, Chemistry Citation Index (CCI), Biochemistry & Biophysics Citation Index (BBCI), Current Contents/Physical, Chemical & Earth Sciences (CC/PC&ES), MEDLINE and Index Medicus. Please have a look at the content of the latest issues and the advance articles. The overall responsibility for the journal lies with the Ownership Board, which consists of members from ESP and EPA as well as associate members from the publishers, the Royal Society of Chemistry (RSC, Cambridge, UK). 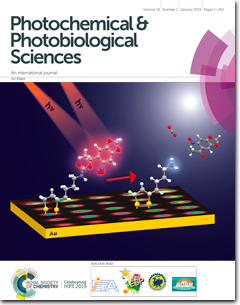 At present there are two Editors-in-Chief and two deputies on the board representing the research areas within photobiology and photochemistry and the active scientific editorial work of the journal. The ESP members who attend the yearly ownership meetings are an ESP-nominated representative for publications (currently Jacques Piette), the ESP President and both the Editor-in-Chief (Rex Tyrrell) and Deputy Editors-in chief for Photobiology. In addition there are meetings of the Photobiology editorial board to which all associate editors are invited and which takes place at the ESP Congress. © Copyright ESP 2018. All Rights Reserved.